ANT black crack box no.03 2016 FRP bypass & box crack is here.This tool contains sixteen GSM crack tools and six different devices (Sony, Huawei Qualcomm, LG, Motorola and HTC) FRP unlocking video tutorials, All tools and videos are 100% working and tested. All GSM ANT Black Crack Box Tools Collection List! 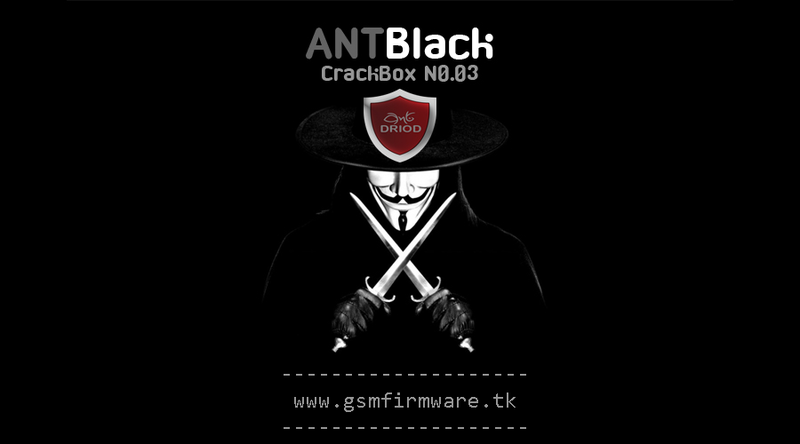 ANT Black Crack Box v3 developed by Thailand developers! How to Install Ant Black Crack Box v3? 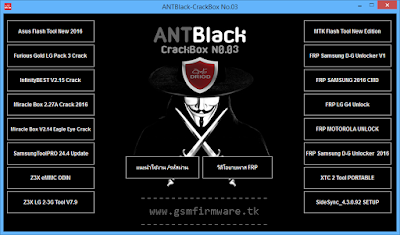 Extract the "ANT Black Crack Box N0.03 By Knot Thailand" compressed file. Open "Ant Black A2Z" main setup file. Click on "Browse..." button and select destination folder or path. After complete installation, Tool automatically run. If you want to run the tool again, Find "ANTBlackBoxV3.exe" icon on the desktop and "Run as administrator".